Deficiency of kidney and liver yin with liver yang rising causing ear ringing (tinnitus), dizziness, headache, insomnia, hypertension or anxiety. Also chronic ear congestion. 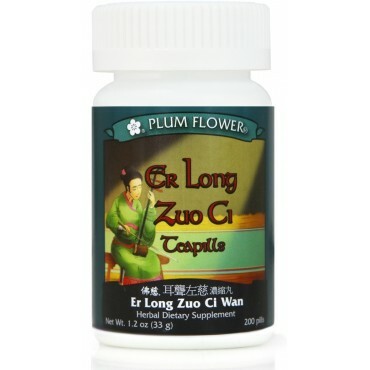 Hypertension due to kidney yin deficiency are some of the imbalances satisfied clients have used this product for. Rehmannia glutinosa root-prep, Dioscorea opposita rhizome, Cornus officinalis fruit, Alisma orientalis rhizome, Paeonia suffruticosa root-bark, Poria cocos fungus, Bupleurum chinense root, Magnetitum mineral, Botanical wax, Talcum. - Shu di huang, Shan yao, Shan zhu yu, Ze xie, Mu dan pi, Fu ling, Chai hu, Ci shi, Botanical wax, Talcum.